JoeEver since my first trip to a grocery store in Sweden, I've been muttering (mostly to myself, but occasionally to those around me), "Chervil. Where's the chervil? I need some chervil." You see, I like a nice bit of egg salad—eggs are cheap and easy protein, and with some fresh chives and chervil (sometimes I use sage instead, which is a little odd, but I like it), a little lemon juice and some nice dijon1, egg salad is a tasty way to eat them. Most grocery stores here sell a small selection of live herbs. 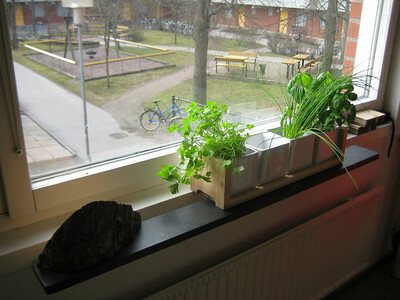 In fact, live seems to be the only way to get fresh herbs here. In our last place this was not ideal, as I struggled to keep the little guys alive, but now we have a window shelf and a southern exposure, so it's much easier. Right now I've got some persilja, some basilika, and some gräslök2. But Sweden does not appear to believe in chervil. Well, after grousing about it for months, I finally got around to doing a little research this morning. In Sweden, it's called körvel, which I'm pretty sure would be pronounced "chervil," but it isn't common (doesn't tolerate the cold). Swedes usually substitute spansk körvel which has a stronger anise flavor. Well, that's not going to cut it for my egg salad, I mean, I don't want more anise flavor… er, wait, anise flavor? And why do all of the pictures of chervil look like parsley? That's not what chervil looks like, it's got slender, paired leaves. Related to parsley? I don't put chervil in my egg salad. I put tarragon in my egg salad. Tarragon is called dragon here, and it's only available in pretty much every grocery store I've been in. I may be an idiot, but tonight I'm an idiot with tasty egg salad. So that's something. 1 This is silly, but may I just add that the Grey Poupon here is outstanding mustard? I got a small jar our first week here, and we've been amazed at how much more flavorful it is. Maybe it's just fresher—America's Test Kitchen says that dijon loses heat rapidly even when unopened. Anyway, it's good stuff. 2 The chives took some searching—for some reason, chives and dill are sold in smaller pots, and placed next to the fennel in the fresh produce section, instead of off next to the potatoes and onions where the rest of the live herbs go. It's not just a single chain doing it, either, it seems to be everyone. Tarragon in egg salad...that sounds good. I'll have to try that. It's good in scrambled eggs too.